Rowenta DW5197 Focus Steam is an impressive model offering 1,725 watts of power and 400 steam ports for even distribution. It offers features such as a stainless steel sole-plate, anti-drip, anti-calcium system and self-cleaning to make your iron much more enjoyable to use. The Rowenta Focus iron heats up well, and there is little time spent waiting for it to reach temperature. 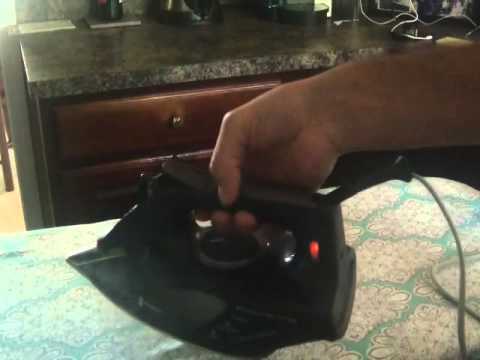 In less than 60 seconds, you can begin ironing. Some buyers in Rowenta iron reviews mention that the user manual lacks instructions in place of images. This may make it harder to follow along and understand how to use the unit. The cost of this Rowenta professional iron is a little steep compared to many others. It costs more than other models that may even have better features. Many other models have just as many favorable Rowenta irons reviews, but they cost much less. The Rowenta Focus DW5197 model is said to be made for those who make and design their own clothing, and there are many features that specifically serve these types of users. The iron utilizes 1,725 watts of power and features a polished stainless steel sole-plate. This plate has 400 steam ports and produces a smooth glide for effortless pressing. The number of steam ports allows for efficient steam distribution that gets wrinkles out of even stubborn fabrics. There are two buttons to produce a spray of water and burst of steam when you need help in straightening clothes. The temperature is controlled by adjusting a dial located under the handle, and the unit’s precision tip helps reach difficult areas of your clothes. The Rowenta steamer can be adjusted with the auto-steam feature that adjusts the output based on the temperature of the sole-plate. It has a water tank capable of holding 10 ounces of water. You can also use this iron for vertical steaming of drapery and hanging clothes, and its anti-calc and self-cleaning features help remove debris and keep the steam holes free. Like some other Rowenta irons on sale, this model is made for clothing creators who press clothes for long periods on end. Because of this, the iron has no automatic shut-off feature. The unit will never shut down after being turned on until it’s unplugged. If you often press large volumes of clothing at a time while also sewing, this component is very convenient. If you’re a standard user who has kids, pets or a tendency to forget to unplug your iron, you may need to consider another option. This unit has a cord that is almost 8 feet in length, and it pivots 360 degrees. For less than $100, this model offers great power and performance. Rowenta iron cleaning is important for proper maintenance. Even those who may not know how to clean a Rowenta iron have the convenience of its self-cleaning feature. The main drawback mentioned in steam iron reviews is its lack of an automatic shut-off feature. If you don’t need the automatic shut-off found on most other Rowenta steam irons, this one may be the one for you.